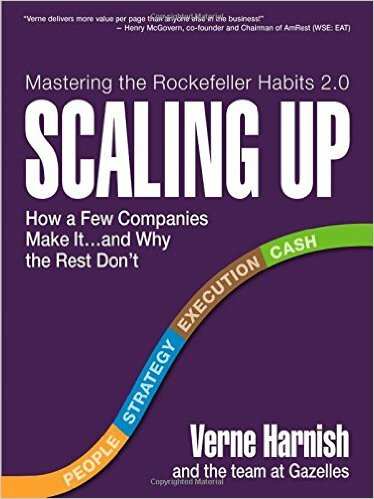 Scaling Up provides an essential framework on which to build your business. It will help you define your focus and business structure. On top of this, you embed your own core values and systems and develop your own blueprint for business growth. It’s easy to read, relevant and packed with practical, useable information – it gets to the point and it makes so much sense! The tools and techniques in this book are based on what works in the real world and have decades of research and successful application behind them. The book includes a series of new one-page tools including the updated One-Page Strategic Plan and the Rockefeller Habits Checklist. It’s written so everyone, from those on the factory floor to the senior management team can become aligned and contribute to the growth of a business. Harnish says running a business is ultimately about freedom. Scaling Up shows business leaders how to get their organisations moving in sync to create something significant and how to enjoy the ride.